Dallas is packed with major historical sights, landmarks, monuments and architectural wonders, making it one of the most exciting and interesting cities to visit in the USA. Whether you are looking for contemporary buildings or well-preserved, authentic structures that will take you back in time, Dallas has plenty of landmarks to offer keen sightseers. Some highlights include the Reunion Tower, the John F. Kennedy Memorial, several buildings in the Arts District and Fair Park outside of the city. The famous Bank of America Tower was finally completed in 1985 and remains the tallest building in the city, measuring over 275 meters / 900 feet, with 72 stories. This instantly recognizable Dallas landmark is an important part of the city's skyline and can be seen for miles at nighttime, when the stunning skyscraper is illuminated and outlined by glowing green argon tubing. 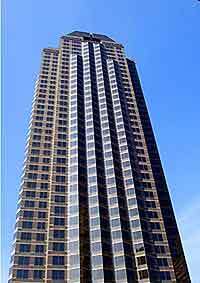 Built as an office block, the Dallas Bank of America Tower features reflective glass and modern architecture. Older than most of the buildings that surround this impressive structure, the Gothic-style sanctuary, built by Victorian architect Nicholas J. Clayton, is situated just in front of the Morton H. Meyerson Symphony Center. This is one of many impressive buildings of culture that make up the Arts District. Inside are several important religious works of art and the front façade is particularly inspiring. Open hours: daily 09:00 - 18:00. 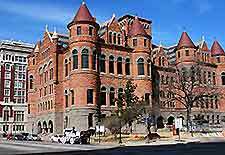 One of the city's most famous landmarks in downtown Dallas is the Old Red Courthouse which was built in 1892 from red sandstone. This Romanesque-styled courthouse is an impressive castle-like landmark that has been carefully restored and is now used as a museum and visitors reference center. It is also rumored to be haunted. 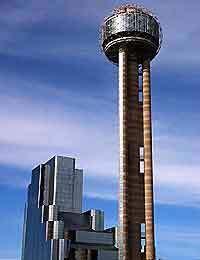 An instantly recognizable landmark in Dallas is the 55 storey Reunion Tower on top of the Hyatt Regency. By night the distinctive dome on top lights up and there is an observation tower inside offering excellent 360° views of Dallas. There is also a restaurant and cocktail lounge which rotates on a 55 minute schedule. This distinctive, modern building located in downtown Dallas was designed by Mexican architect and AIA gold medal winner, Ricardo Legorreta. Host to a museum and special events it is one of the city's newer must-sees and reflects Texas's important links with the culture of its Southern neighbor. Situated in the heart of the Arts District, the 'Mort', as it is affectionately known, was designed by world-renowned architect, IM. Pei and it is home to the Dallas Symphony Orchestra. 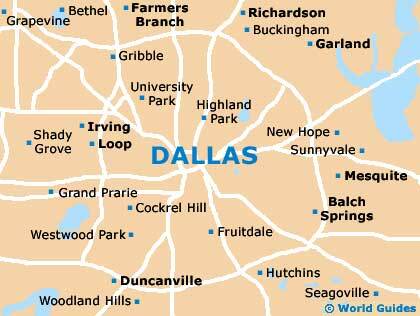 This is a delightful historic village that contains some wonderful authentic, restored buildings where you can get a feel for what Dallas was like in days gone by. These beautiful sets of buildings, based on the Paris' Grand Opera House, were constructed in the 1920s in order to provide office and retail space for the booming city. The buildings have been renovated and are now used for mainly residential purposes.